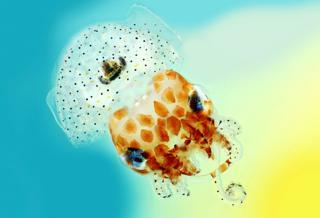 This magnified image of a baby Hawaiian bobtail squid - which has a light organ on its backside that houses a colony of glowing bacteria - is one of the finalists in the 2017 Wellcome Image Awards. The squid - which measures only 1.5 cm across - provides food and shelter for the bacteria in return for their bioluminescence. The glow is similar to moonlight and starlight, and helps mask its silhouette in the Pacific Ocean - reducing the risk of predator attacks from below. 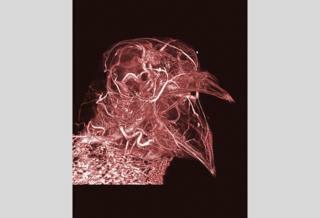 This is the 20th annual Wellcome Image Awards which celebrates colourful and captivating scientific images - from photography and illustration, to super-resolution microscopy and medical scans. Scroll to see more of the finalists. This character "Stickman" is the alter ego of the artist who suffers from Crohn's disease - a chronic condition caused by inflammation of the digestive system. 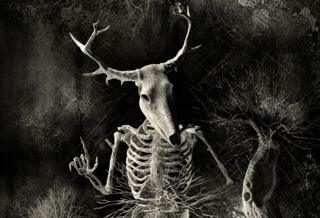 The skeleton is made of sticks rather than bones - to show the body's fragility to a flare up. 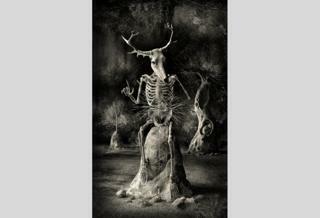 "This image is a stunning representation of what it must be like to have Crohn's disease and it's like nothing I've seen before in terms of the portrayal of someone's condition. "It conveys the pain and torment the sufferer must go through. The image really resonates and is beautifully composed. It's a haunting piece." 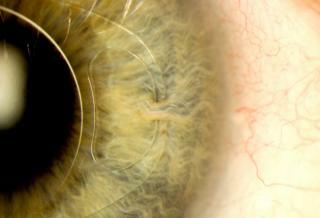 This image shows how an "iris clip" - also known as an artificial intraocular lens (IOL) - has been fitted on to the eye of a 70-year-old man with a 3mm surgical incision. It is used to treat conditions such as myopia (nearsightedness) and cataracts (cloudiness of the lens). The patient regained almost full vision following his surgery. "I think this picture is absolutely stunning in its clarity. I am sure I will be using it frequently to demonstrate to my patients the intricacies of ocular lens implants." 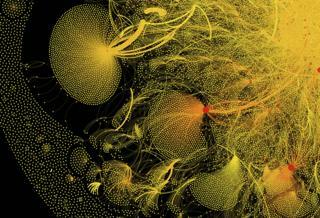 This is a graphical visualisation of data extracted from tweets containing the hashtag #breastcancer. Twitter users are represented by the dots, or nodes, and lines connecting the nodes represent the relationships between the Twitter users. Nodes and lines are sized differently according to the number and importance of other nodes to which they are connected. "A beautiful starburst of pointillist coloured nodes, a complex representation of convergent energies, the image visualizes a topic so important to discuss today." 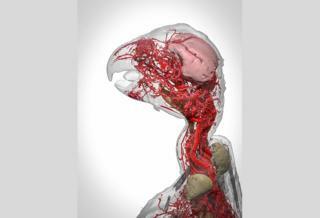 This image shows a 3D reconstruction of the head and neck of a dead African grey parrot - with a highly intricate system of blood vessels. 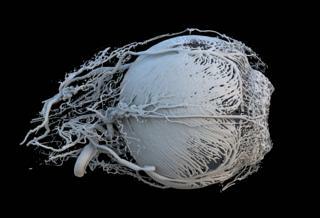 "This wonderfully detailed image, mapping blood vessels in 3D, succeeds in being both beautiful and informative. The ghosted outline of the bird's head and neck provides context." 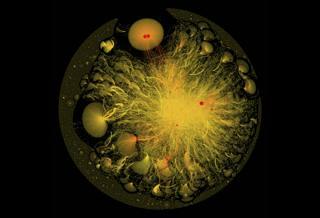 This image shows the intricate network of blood vessels in the neck and head of a pigeon - down to capillary level. All animals possess unique variations in their anatomy that help them adapt to their environment - and this extensive blood supply just below the skin helps the bird control its body temperature through a process known as thermoregulation. "The amazing quality of this image shows how complex and dense the network of blood vessels is, and its seemingly angry squawk at the viewer makes it really eye catching." 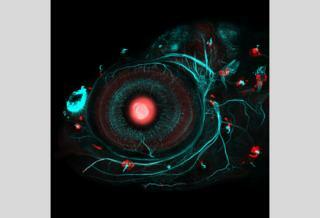 This polarised light micrograph of a section of cat skin shows the blood supply feeding hairs and whiskers. 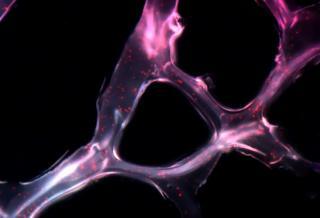 Blood vessels were injected with a dye (here shown as black) to visualise the capillaries in the tissue. 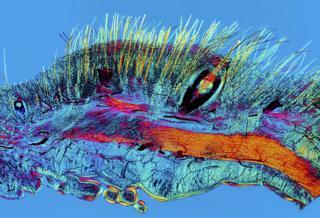 It is a composite view of a Victorian microscope slide, and is made up of 44 individual images stitched together. "At first glance it could be a painting of a tiny underwater creature, or some weird fairytale monster. But the fact that this is a cat's whisker is a real surprise. "This image just highlights to me amazing details that exist in even the simplest organic structures, a product of millions of years of evolution right there in front of us." 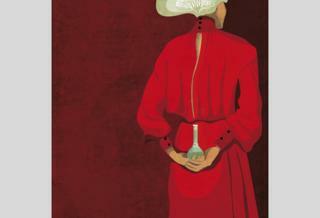 This work of art depicts Rita Levi-Montalcini (1909-2012) - an Italian neurobiologist. She was the joint recipient of the 1986 Nobel Prize in Physiology or Medicine for the discovery of nerve growth factor (NGF) - which has increased the understanding of many conditions, including tumours, developmental malformations and dementia. For her early work in Italy, Levi-Montalcini built a small laboratory in her family home and worked in secret because of Mussolini's 1938 Manifesto of Race, which barred non-Aryan citizens from having academic careers. "The striking colours reflect the courage of this Nobel prize-winning scientist, and the details reveal the way she had to conceal her work from the fascist powers during the war." 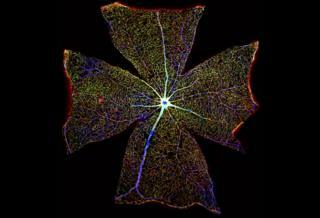 This digital image of a mouse retina, at the back of the eye, contains light-sensitive cells responsible for converting light into electrical nerve signals that the brain can process. 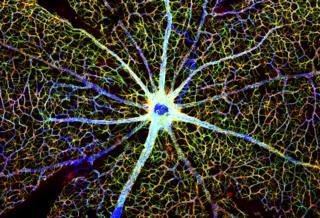 Blood vessels (blue) can be seen radiating from the centre of the image - with astrocytes, specialist cells of the nervous system, double stained in red and green. Here, scientists are researching whether the function of astrocytes changes during retinal degeneration, which may lead to the development of new treatments for vision loss. "An extraordinary montage of over 400 tiled images showing in incredible detail the intricate filigree pattern of astrocytes in the tiny retina of a mouse." The problem with conventional cancer treatments such as chemotherapy is their non-specificity, and the side-effects they cause. But the hope is that this mesh can be used as a cancer therapy through surgical insertion around a tumour. The image shows how a synthetic polymer (purple) has been combined with two types of miRNA, in red, which are short genetic sequences responsible for controlling cell growth. The miRNA molecules can be released locally into cancer cells to stop them dividing. This therapy has already been tested on mice, where tumours have shrunk by nearly 90 per cent after just two weeks. "At first glance, this image made me think of a futuristic, sci-fi movie in which a normally-invisible technological wonder ends up saving the world. The possibility of using RNA as a therapeutic biomaterial delivered by a clever engineering approach opens up new opportunities in the personalized medicine era, where platform technologies are key." This shows a 3D model of a healthy mini-pig eye. The dent on the right-hand side of the image is the pupil, the opening that allows light into the eye. Blood vessels shown are bringing energy and food to the muscles surrounding the iris, which controls the amount of light entering the eye. The smallest vessels seen here are 20-30 micrometres (0.02-0.03 mm) in diameter. "The data gathered to make this 3D print allows the scientist to view the detail and handle it in three dimensions in a way that a 3D screen image cannot do. It's fascinating to see the ways in which new technologies complement one another in finding out more about how organs work." 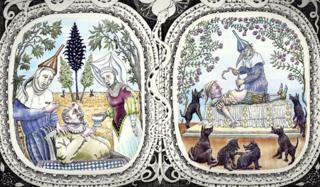 These four scenes are inspired by works by medieval artists and the 15th Century Dutch painter Hieronymus Bosch. They are separated by Asclepian snakes, representing both Asclepius - the ancient Greek god of medicine - and the modern-day symbol for medicine. 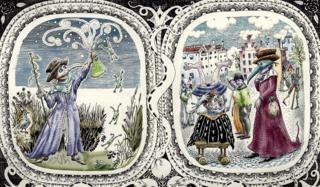 The top left image is a parody of alchemy - with a masked figure holding a conical flask from which frogs jump. The top right shows a man sitting on a cart, asking a doctor if his disordered limbs can be repaired. In the bottom left panel, a patient is being offered tea as a surgeon operates on his opened head. And in the bottom right, a doctor is performing an operation - and appears to be pulling a bunch of sausages out of a patient's belly while surrounded by hungry dogs. 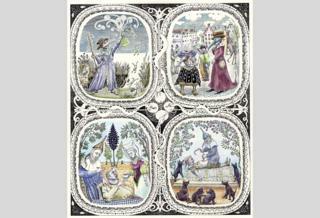 "With its style and watercolour tones reminiscent of old manuscripts, the wit of this illustration is in the details. "The faceless doctors with their 'plague doctor' masks and the dunce-like funnels on their heads." This is an image showing a 3D-printed reconstruction of the white matter pathway connecting two areas of the human brain - the arcuate fasciculus. The arcuate fasciculus links grey matter, which contains cells and is responsible for processing information, with white matter which connects areas of grey matter - allowing information to be transferred between distant areas of the brain. "What is so mesmerizing about the 3D model of a brain pathway is that it renders visible the very mechanism in our brain we are using to look at it, a neurological portrait." This is a placenta rainbow. It highlights differences in mouse placental development that can result from manipulation of the mother's immune system. They have been stained to show three proteins. Blue represents the nucleus, where DNA is stored and controlled. Blood vessels are stained red. And trophoblasts, the first cells to form in the developing embryo, are green. Additional colours are present due to an expression of two or more of these proteins in the same cell. "A lot of micrography images I see have been coloured for artistic purposes, but this image balances visual considerations with telling a real story, the rainbow effect communicating the passing of time and the occurrence of a biological process, whilst at the same time being aesthetically appealing." Every cell is surrounded by a membrane, which serves to protect the cell's contents and connect the cell to others to form tissues and organs. Tube-like channels made of proteins span this membrane and control two-way communication between the cell and its environment. Researchers are using DNA as a building material to make synthetic channels that behave in exactly the same way - and this image is an artist's representation of what these channels look like. "The creator has used metallic textures and colours with machine-like shapes that convey the potential of nanotechnology in the future of biomedicine." Our spines allow us to stand and move, and they protect the spinal cord, which connects all the nerves in our body with our brain. The spinal cord is formed from a structure called the neural tube, which develops during the first month of pregnancy - but problems can occur with neural tube development and lead to conditions such as spina bifida. 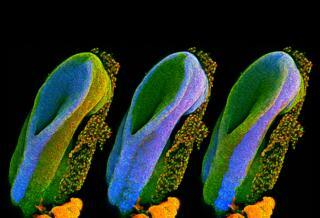 This series of three images shows the open end of a mouse's neural tube, which researchers are studying to try to prevent the development of such conditions. "The elegant curves of these embryonic forms look almost like unfurling lilies. We see how even the beginnings of life can be beautiful, and how revealing and studying these forms can help science to identify sources of debilitating congenital conditions." This artwork is taken from Chrysalis, a project at the University of St Andrews designed to bring together women scientists at all stages of their careers to talk about issues and to seek advice and inspiration. Some of its conversations were interpreted in various ways by artist Sophie McKay Knight - and this example explores what women feel they keep hidden in the work environment, such as the pull between their career and home life. The woman's veil is made up of the molecular structure of a sugar molecule. "A recent study just confirmed that in the biotech industry, women hold only 10% of board positions. So I am particularly pleased that many of the (male) Wellcome judges insisted on including this image. "I hope it will raise awareness and serve as a conversation starter on our continuing journey towards gender equality." This four-day-old zebrafish embryo has been modified using two mechanisms borrowed from the worlds of bacteria and yeast - which are widely applied in genetics research. Scientists used DNA-editing technology to insert a gene - called Gal4 - next to the gene that the researchers wished to study. These Gal4 fish were then bred with special reporter fish, to create hybrid fish where the gene being studied fluoresces red whenever it is activated. "The 2017 Wellcome Image Awards would not be complete without an appearance by the gene-editing technique CRISPR/Cas9, so de rigueur these days. CRISPR allows scientists to precisely replace a specific piece of DNA, opening up the opportunity to cure a wide range of diseases caused by defective genes. "It is a stunning image that simultaneously highlights both the simple beauty and the complex sophistication of nature." 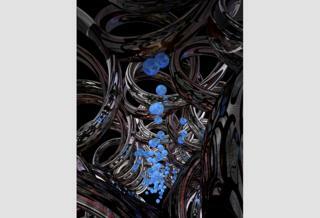 Here, researchers are investigating how neural stem cells grow on a synthetic gel called PEG. 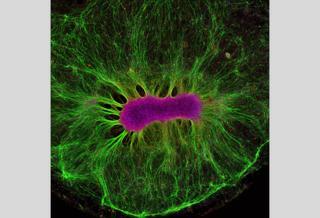 After just two weeks, the stem cells (magenta) produced nerve fibres (green). This work supports the Human-on-a-Chip project, which is addressing the inefficiency and cost of traditional drug testing. Researchers have devised ways of growing miniature organs on plastic chips, which they hope can be connected to represent the human body. This could then be used to accurately predict the effectiveness and toxicity of drugs and vaccines - and remove the need for animal testing in medical research. 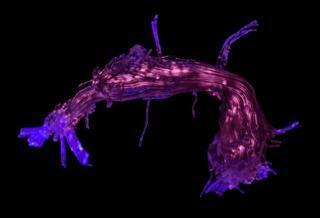 "'Mini-brains' grown in an incubator are powerful research tools. This image of neural stems cells is stunning - and is also useful in helping to show how brain cells in development organise themselves." Here, a patient is being treated by a doctor at a makeshift eye clinic in India. This image was taken while the photographer was volunteering for the charity Unite For Sight. Since 2000, the charity has given eye care to 1.9 million people - some of whom live in extreme poverty. "As a general practitioner in the NHS I often forget how lucky I am to work in relatively comfortable surroundings. This picture demonstrates that not all primary care professionals are as lucky as I am." In order for plants and animals to grow and remain healthy, cells need to have the ability to replicate. During cell division, also known as mitosis, the entire DNA content of the cell is copied, with half going to each new cell. DNA is found in a region of the cell called the nucleus, which acts a bit like the brain. 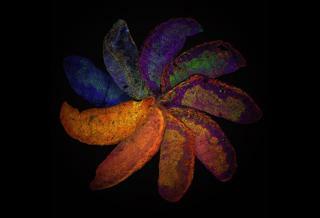 This picture shows the nucleus of one of two new daughter cells. The DNA in this cell has somehow become caught, and is being pulled between the two cells. This has caused the DNA to unfold inside the nucleus, and DNA fibres can be seen running through it. 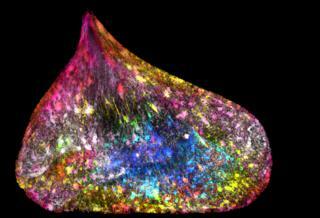 "This jewel-like image shows a rare moment in time - chromosomes being tugged apart in a dividing cell. 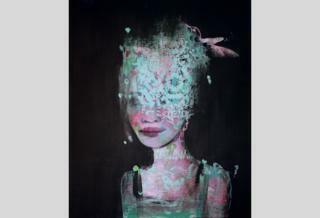 I love the dynamism in the image as well as the choice of colours." The winning images will be exhibited from 16 March 2017 in venues across the UK, Europe and Africa. The UK venues include: Aberdeen Science Centre, At-Bristol, Cambridge Science Centre, Dundee Science Centre, The Eden Project Cornwall, Glasgow Science Centre, Techniquest Cardiff, Millennium Point Birmingham, W5 Belfast and in the windows of Wellcome's HQ in London. The non-UK venues include: Africa Health Research Institute, South Africa; Polytechnic Museum, Moscow, Russia; Science Gallery, Dublin.